Call them the biggest of custom shops or the smallest of production plants; either way, Hamer knows how to put together some fine guitars. Even their most affordable instruments reveal an attention to detail you might expect to find only in high-priced guitars. So it only goes to figure that a costlier instrument like Hamer’s Newport Hollowbody electric guitar exhibits some truly topnotch craftsmanship. 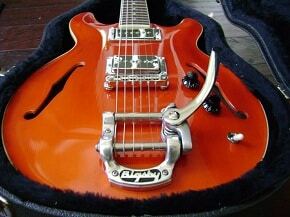 The Newport is part of Hamer’s unique line of true hollowbody instruments, which also includes the Newport Pro. It features a hand-carved spruce top on a mahogany body and a mahogany set neck, all bound in ivoroid. The transparent orange finish is subtly flecked with silver sparkles, and the chromed hardware includes Grover Super Rotomatic tuners, chrome pickup surrounds, a Tune-O-Matic bridge and a Bigsby vibrato tailpiece.